Hi. My name is Emma and I’m a gym-a-holic. I’m currently sitting in the café of David Lloyd Gym, Cambridge. 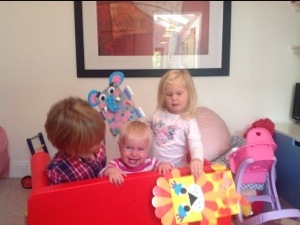 The kids are playing in the mini play-barn after a busy morning in the crèche for the girls and a swimming lesson for Sam. 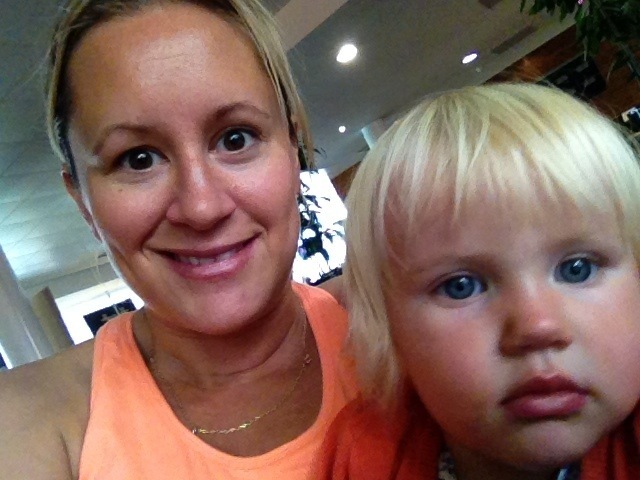 Sam also had the pleasure of watching me do a Zumba class whilst also playing on my iPad – he had a lovely time. Half way through the class he whispered for me to come over and said in his most earnest voice, “good work mum.” Bless. So what’s happened to me? Why this sudden burst of activity? Well, it all started at the school gates when I got chatting to a mum who was looking fantastic. She’d joined the gym and was getting visible results. To be honest, I’ve always hated going to the gym but was getting to the point where I was really fed up with being wobbly. I’ve been pregnant or breastfeeding for the past 7 years and after nearly 2 years of Izzy not sleeping properly I felt like it was time to start feeling alive again, not just existing through days of exhaustion. I also wanted to feel good about my body again, simple really. I’m not sure why this time the decision to get fit has stuck, but I’m feeling good and slowly losing inches. For me the most rewarding thing has been the sense of well-being I feel. Excercise really is making me feel better. I’m fitter and stronger than I’ve been in years and even though I’ve still got lots of weight to lose, I feel in control because I know I’m actually doing something about it. There are loads of classes here and my favorite class is Body Attack. Believe me, you really do feel like you’ve been attacked after it, but it’s high energy and great for fitness and weight loss. The best bit about this gym though is that there’s a crèche so I don’t have to go out in the evenings when I’m knackered but can go in the mornings instead when I have the most energy. I also got a 3 month membership for the kids over the summer so we can all come here loads during the holidays, to swim mostly, as they have an outside pool which has been fantastic with the good weather. So, I’ve become a gym bunny, well perhaps that’s slightly over-ambitious, I’m probably more of a gym gerbil, but you get the idea. I’m doing something rather than feeling rubbish about myself and it feels great. Advice needed about Karvol Diffuser! 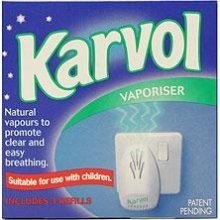 A friend of mine has found out recently that Karvol have stopped making their diffusers and the only ones she can find on the market have night lights on them which keep her tiddlers wide awake. Does anyone know of an alternative product that doesn’t have a night light attached?! Please let me know if you do, many thanks! …it’s 7.52pm and everything should be quite peaceful and quiet. HOWEVER, Izzy is screaming and Im trying to ignore the fact that she’s SCREAMING. We are staying with our best friends in the midlands. Their house is in an idyllic farm house overlooking beautiful countryside. We have good company, good food and good booze. However, all I can think about is the fact that my baby girl is screaming. Not whimpering, not grizzling, just SCREAMING AT THE TOP OF HER TINY LUNGS! So, obv, she’s still screaming. My hub and I have been very consistent and persistent with the controlled crying over the past 2 Months and I know that we’ve done well, as she’s at last sleeping until 5.15am (God give me strength). I find this whole thing thoroughly depressing if I’m honest. It’s not as if I don’t have anything else to do, I have 2 other children to look after, a husband to cook for and a house to clean. My God, did I ever dream of such heights?! I’m a modern woman for God’s sake! Ok, deep breath. You know what? At this moment, when I’m here, struggling to cope with my baby screaming and crying, I want to say a big, well done, to all the mums out there who are holding on to their sanity by a thin thread. You are not alone! I’m standing on the precipice of sanity with you and we CAN get through this moment. This moment WILL pass and they WILL stop crying. We CAN cope. We LOVE our kids and life IS really good. Big deep breath lovely mums and dads out there, be calm and carry on. This time will pass, these years will pass and then they’ll be gone, without a backward glance. Blimey, I’m even more depressed than I was before. I love the holidays. No school run, no packed-lunches and no rushing. Just pure, unadulterated, re-lax-ation. That is until 8.30am when the children start to go MENTAL. Day 1. 8.30am – painting, including sticking and glueing. I’ve never seen so much art and so much mess. 8.35am – get dressed to go somewhere, anywhere that isn’t the house, arghhhhhh nowhere opens until 9am. Ok, rethink Emma. Right, we shall do some very slow, imaginative dressing that somehow includes baddies. Ok 9am, out in the garden. Let’s pick some leaves for an autumnal collage. 9.01am. Leaves picked, more sticking and gluing. 9.18am – erm a jigsaw? 9.27am telly. You get the idea. The funny thing is though that after the initial panic of Monday morning, half term is lovely. We seem to just exist and potter gently with the occasional shriek/fight/disaster mixed in for fun. We saw relatives, we went shopping, we went to the library and we just got on with hanging out. What I realised is that the kids just like being at home, they don’t require constant interaction, they just need a rest and a mooch with a bit of planned stuff thrown in. They mainly want to play and sometimes just need a little push in the right direction. It always seems so complicated, but it’s not really.